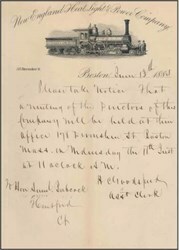 Letter from the New England Heat, Light & Power Company issued in 1884 giving notice of directors' meeting. This historic document has a vignette of a train. This item is hand signed by the Company’s Assistant Clerk and is over 119 years old.